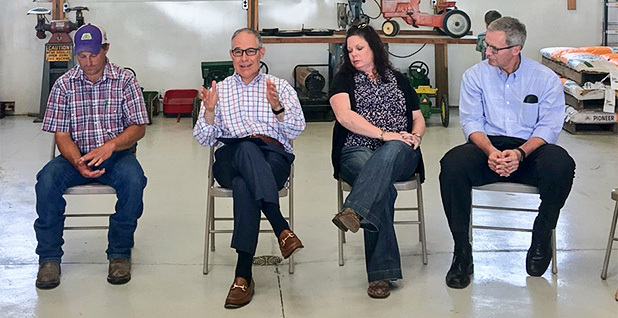 EPA Administrator Scott Pruitt is facing fresh skepticism among Republicans, including one of his staunchest supporters from the Sooner State. Republican Sen. Jim Inhofe of Oklahoma, one of Pruitt's key allies on Capitol Hill, told reporters yesterday he would favor having his longtime friend and EPA chief appear before the Senate Environmental and Public Works Committee to address a growing string of ethical controversies. But whether a hearing will take place is ultimately up to the committee, Inhofe said. And Leacy Burke, a spokeswoman for the senator, emphasized he is not calling for Pruitt's resignation. Republican Sen. Joni Ernst of Iowa, who has criticized the EPA chief over his handling of the renewable fuel standard, took to Twitter to second Inhofe's call for a face-to-face meeting. "I support Sen. @JimInhofe's call for a hearing on EPA Administrator Pruitt's scandals; and I continue to urge the President to take a hard look at Mr. Pruitt's actions — as I do not feel that Mr. Pruitt is serving @RealDonaldTrump's best interests," Ernst tweeted. Those comments from Inhofe and Ernst arrived within hours of growing calls among conservative ranks for Pruitt to step down, including criticism from Laura Ingraham, a conservative radio host for Fox News whom President Trump follows on Twitter. National Review, a semi-monthly conservative editorial magazine, also ran an editorial calling for Pruitt to resign. "We share most of Pruitt's views about environmental policy. But the same could be said of many other people, including Andrew Wheeler, the agency's deputy administrator, who would become acting administrator upon a vacancy in the top job," the editorial said. "Pruitt is replaceable. And he should be replaced." Democrats, who have for months slammed Pruitt's management of the agency, his staff and agenda of rolling back critical environmental rules, took a longer view. "Actually, what we're looking forward to is when he files his financial disclosure," said Sen. Tom Carper of Delaware, the top Democrat on the Environment and Public Works Committee. "And he asked for an extended 45 days ... and we're looking forward to finding out more when that is filed." For now, Pruitt continues to enjoy Trump's support, stemming mostly from his work implementing the administration's agenda. When Fargo, N.D.-based radio host Scott Hennen asked Pruitt about being in the "eye of the storm" yesterday during an interview, the EPA boss immediately pivoted to his success transforming EPA as Trump sees fit, which he said has angered the "left." Pruitt also touched on the endangerment finding, the scientific determination that underpins the agency's climate change regulations. The EPA head said petitions have been lodged asking the agency to revisit the finding, calling its passage in 2009 a "breach of process." EPA, he said, should have "done its own homework," and the agency is now evaluating how the process was conducted. When asked whether EPA has the authority to repeal the finding, Pruitt said Congress has never acted on the issue or spoken on it. "It's something we're evaluating," he said. Reporters Kevin Bogardus and Nick Sobczyk contributed.